Red Bud Isle A literal oasis for dogs. Surrounded by water, this 13-acre leash-free dog park is a must visit for any canine lover. Dogs can romp, swim, and fish (my dog likes to chase after unsuspecting minnows) all under the comfort of shaded natural paths. Bring a towel you (and your pup) are bound to get a little dirty. Barton Creek Greenbelt More the adventurous type? Explore Austin&apos;s beautiful Hill Country together via this popular greenbelt. Here you&apos;ll find over seven miles of walking, hiking and mountain biking trails perfectly suited for sniffing. Don&apos;t forget your suit - there are also several swimming holes along the creek for cooling off during the warm summer months. 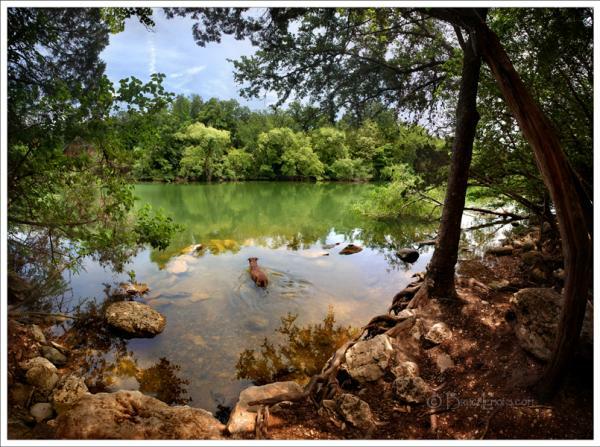 Lady Bird Lake Hike & Bike Trail One of Austin&apos;s top spots for dog-lovers of all breeds. 10 miles of trails bordering Lady Bird Lake in downtown Austin serve as a social hub for runners, walkers, cyclists and canines. A memorial at Auditorium Shores honors the late blues man Stevie Ray Vaughan. And from March through early November, over a million Mexican free-tailed bats fly nightly from under the Congress Avenue Bridge. Hopefully, your dog won&apos;t try to chase after them. Bella the Dog. Photo courtesy of Bruce Lemons. A laid-back Austin mainstay, Austin Java serves breakfast all-day (try the gingerbread pancakes - yum!) and features several locations with outdoor patios. Opal Divines serves up classic American fare, spirits and outdoor misting stations. And for those pups that are watching their waistline (like mine should be), go natural at Whole Foods. The downtown headquarters location features 14 healthy in-store eateries and plenty of outdoor space for people/dog watching. Bella the Dog in Lady Bird Lake. Photo courtesy of Bruce Lemons. The Driskill Hotel: Austin&apos;s most historic hotel offers a Pampered Pet Program, which includes a pet bed, designer dishes and mat, gourmet treats and more. Hotel San Jose: Built in 1936 as an ultramodern motor court, this 40-room bungalow style hotel located in the heart of South Congress provides the ultimate Austin atmosphere. Hyatt Regency Austin: Steps from the Hike & Bike Trail, the Hyatt Regency is perfectly located for spontaneous outdoor four-legged adventures. What&apos;s your favorite Austin dog-spot? Hit us up at @VisitAustinTX with #TrueAustin.